Lights and power outlets are two of the most popular parts of a home that smart home enthusiasts automate first. However, there is another part of your house where automation can bring many benefits: The Garage Door. The first benefit is that you can control the garage door from anywhere. Pair it with a camera, and you can open the door when someone needs access to the garage. You can even open it when the delivery guy calls you. Another benefit is to trigger a series of other automation when the garage door opens, like switching on the house lights when you get back home after work. 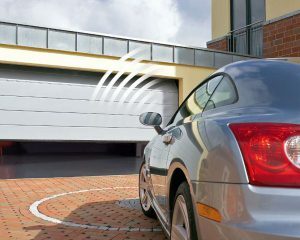 Chamberlain’s MyQ works with most garage doors manufactured after 1993 and uses the sensor on the door to activate. The MyQ app is available on iOS and Android and supports Nest, Wink, SmartThings and Xfinity Home. A recent update added support for Google Assistant and IFTTT, although you will need to pay a $1/month subscription for the service. The GoControl is another excellent garage door controller that would rival the MyQ except that it is a Z-Wave device and as a result will only work if you have a hub that supports Z-Wave. The Wink smart home hub is one that supports Z-Wave. The only downside of the GoControl unit is the high cost of customer support.